OK, enough drooling from The Cooking Fiend…I came across this recipe while watching the Pillsbury Bake-Off on Food Network over a year ago and HAD to try it out. I’ve made these pieces of heaven a few times since and every time, I get the same reaction: “OH MY GOD. THESE ARE INCREDIBLE.” I know, I know, I think to myself as the treat melts all over my tastebuds. How could they NOT be incredible? They did, afterall, win the original baker $10,000!! I made these for Father’s Day yesterday for my dad and to bring to my brother’s house where we were going for dinner. After brunch, my parents’ eyes practically rolled back in their heads after tasting them and Kyle was annoyed because I didn’t give him one – I was trying to bring as many as possible to dinner later in the day! The concept is simple: a chocolate chip cookie filled with a layer of melted white chocolate and peanut butter followed by a layer of milk chocolate (or dark or semi-sweet) then topped with whatever you want – toffee crumbles, crumbled crunchy granola bars, or drizzed with more chocolate, like what I did this time around. Overall, the recipe is a wee-bit time consuming, but TOTALLY worth the effort. Below is the original recipe but I’ve made a number of modifications and notes (see *s) that better suit my tastes and availability of some products. Be sure to read these before you buy the ingredients! Bake 10 to 15* minutes or until edges are deep golden brown. Cool in pans on cooling racks 5 minutes. With tip of handle of wooden spoon, press dough down in center of each cup to make room for 2 tablespoons filling. Meanwhile, in 2-quart saucepan*, melt vanilla baking chips and 3/4 cup of the peanut butter over low heat, stirring constantly. 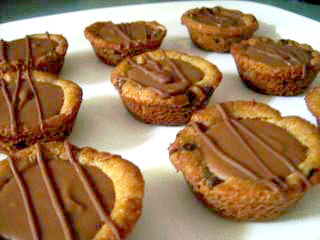 Divide mixture evenly into cookie cups (about 1 tablespoon each*). Refrigerate 10 minutes. In same 2-quart saucepan*, melt chocolate chips and remaining 3/4 cup peanut butter over low heat, stirring constantly. Divide chocolate mixture evenly on top of peanut butter mixture in each cup (about 1 tablespoon each*). Sprinkle crushed granola bars over top of each. Refrigerate until set, about 1 hour. Remove from muffin cups before serving*. I have a tough time finding pre-packaged peanut butter cookie dough so I use break-and-bake chocolate chip cookies (Nestle – 24 per package). I’ve found that the chocolate chunk do not work as well so I opt for the regular chocolate chip. Buy the best white chocolate chips you can find; I use Ghiradelli – I’ve tried Nestle and wasn’t at all thrilled with the result. If you can’t find white chocolate chips, find a good quality white chocolate bar and break it up (i.e., Ghiradelli, Lintz, etc). Ditto for the chocolate chips. I subbed out the semi-sweet chips for milk chocolate and am very happy that I did so. The recipe calls for crushed crunchy granola bars to sprinkle on top before the top layer sets. I had trouble crushing them up so small so I don’t use them anymore. I’ve used Heath toffee bits and have drizzled chocolate and might consider some chopped fresh strawberries next time I make them. Number 1 of the directions is my addition. Since I use the break-and-bake cookies, I’ve found that breaking the dough into its pre-determined pieces and allowing them to soften to room temperature really helps getting them into the muffin cups. When they are soft enough, flatten them down into a circle then place them into a very well-greased mini-muffin pan (one 24 cup or two 12 cup). Grease the cups and the top. You won’t need to make a 1/4 inch rim with the dough because it will rise enough on its own; just make sure the dough comes to the top of the muffin cups. Cooking them for 10-12 minutes will suffice – more than 12 minutes will overcook the cookies. Use a double boiler or a heat-safe bowl over a couple inches of boiling water to melt the chocolate. Don’t attempt to melt in the microwave – I’ve learned that the hard way. There will probably be leftover white chocolate mixture – either save it or ditch it. Then repeat the process with the chocolate chips and peanut butter. One tablespoon of each filling is too much. A heaping teaspoon (use an actual teaspoon – what you would use to stir your coffee with – not a measuring spoon) of each filling is plenty. When you’re finished filling the 2nd layer, you’ll know if you need to add a little more. OMG! Those look amazing. Might be a little too complicated for a novice cook like me, but I will have to try them anyway sometime soon.